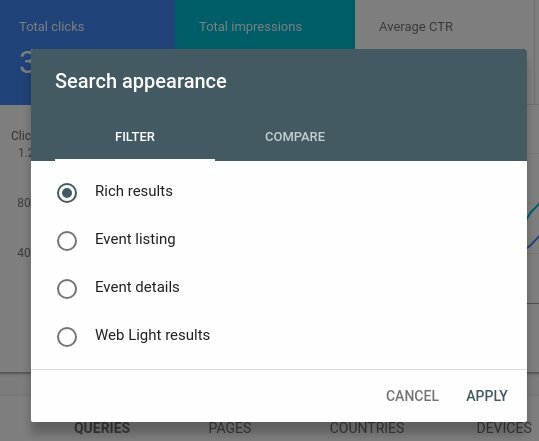 Google has added to the Google Search Console performance reports a filter under the "search appearance" filter for both event listings and event details. This is a new filter to help you see how well your event markup is performing in search. Here is a screen shot under of these two new filter options under the search appearance section. Note, it only shows if your site has event markup on it and is only supported for English web sites located in the US, UK & India. If you do not see it, then that is probably why. Some rich result types have two search result views: a list view and a details view. The initial search result is a list containing the top results, with minimal information about each. The user can either expand the list to show more list items, or click a specific result in the list to open a details view with more information about the selected item. In desktop results, expanding the list automatically opens the details view of first item in the list. This is counts as an impression, but not a click, on the first list item. You can filter the Performance report to show List view or Details view data for a given rich result type (for example, Job listing, Job details, Event listing, Event details). There is a lot more detail in the help document.